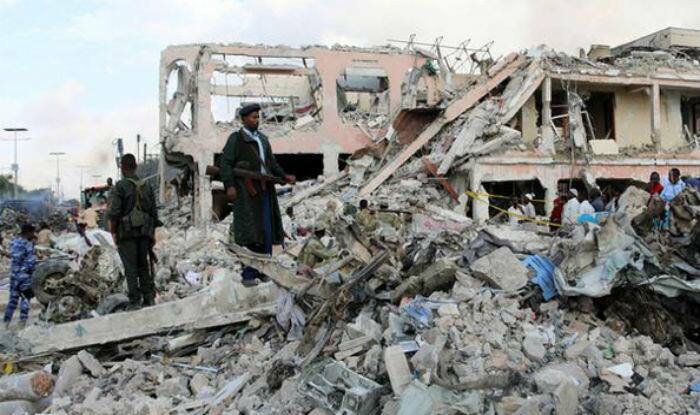 Mogadishu is frequently attacked by al-Shabaab which seeks to establish an Islamic state. Thursday's explosion destroyed two restaurants and cars. Mogadishu: As many as 11 people were killed and several others injured in a car bombing near a hotel in Somalia’s capital city Mogadishu on Thursday, said police. The car was parked outside a restaurant near Hotel Weheliye, reported Xinhua news agency. The explosion took place on Thursday afternoon on a busy road in Mogadishu. It destroyed two restaurants, several cars and three-wheeler motorbikes parked in the area. Witnesses reported seeing clouds of smoke and bodies all over the ground, stated a report. Abdulkadir Abdirahman Adan, the director of the Aamin Ambulance service was quoted by Al Jazeera as saying, “The death toll we have confirmed so far is 11 people, with 16 others wounded.” He added that the death toll could increase. Soon after the bombing, no one immediately claimed responsibility for the attack. The Maka Al-Mukarama road, where the attack took place is one of the main highways which is frequented with businesses and travellers. Last month, at least 12 people were killed and 15 others were injured in a car bomb explosion near the Governor’s office in the Somali capital. Police officer Mohamed Abdelkadir, who was at the scene of the incident, confirmed the figures shortly after the blast in Mogadishu’s central district of Hamar Weyne, Efe news agency reported. The explosion caused significant damage to shops and restaurants in the area which was cordoned off by security forces. Somali militant group al-Shabaab claimed responsibility for the attack, saying it was targeting government officials, according to local media. This attack came after at least seven people were killed and five were injured on January 29 in two car bomb explosions in Somalia’s restive capital.